Israel's Prime Minister Benjamin Netanyahu has hit back after police said he should be charged over alleged bribery cases. Speaking on Israeli television, he branded the allegations "baseless" and pledged to continue as leader. Mr Netanyahu said he was certain that the truth would be revealed. His comments follow a police statement that said there was enough evidence to indict him for bribery, fraud and breach of trust in two separate cases. But Mr Netanyahu said the allegations "will end with nothing". "I will continue to lead Israel responsibly and faithfully for as long as you, the citizens of Israel, choose me to lead you," he said soon after the allegations came to light on Tuesday. "I am certain that at the next elections, which will be held on schedule, I will earn your trust again, with God's help," he said. The 68-year-old is in his second stint as prime minister, and has served in the role for a total of 12 years. The attorney general's office could take months to decide if Mr Netanyahu should face charges. "Over the years, I have been the subject of at least 15 enquiries and investigations," he said in his TV address. "Some have ended with thunderous police recommendations like those of tonight. All of those attempts resulted in nothing, and this time again they will come to nothing." One case centres on an allegation that Mr Netanyahu asked the publisher of an Israeli newspaper, Yediot Aharonot, for positive coverage in exchange for help in reining in a rival publication. Police said the editor of Yediot Aharonot, Arnon Mozes, should also face charges. The second allegation centres on a claim that Mr Netanyahu received gifts worth at least a million shekels ($283,000; £204,000) from Hollywood mogul Arnon Milchan and other supporters. The Jerusalem Post says the gifts included champagne and cigars, and were given in exchange for help getting Mr Milchan a US visa. Mr Milchan, the producer of films including Fight Club, Gone Girl and The Revenant, should face bribery charges, police said. 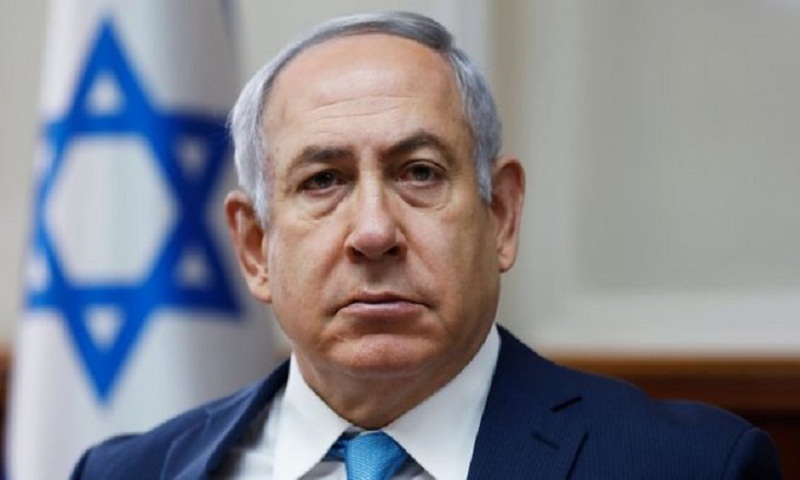 The police statement said that Mr Netanyahu, after receiving gifts, pushed for the Milchan Law, which would have ensured that Israelis who return to live in Israel from abroad were exempt from paying taxes for 10 years. The proposal was eventually blocked by the finance ministry. Police say Mr Netanyahu is also suspected of fraud and breach of trust in a case involving Australian billionaire James Packer. Israel's Channel 10 reported in December that Mr Packer told investigators he gave the prime minister and his wife Sara gifts. Israeli media say Mr Netanyahu has been questioned by investigators at least seven times. Israel's centre-left opposition alliance, the Zionist Union, called on Mr Netanyahu to resign. "The state of Israel needs a leader whose hands are clean and who is solely devoted to the affairs of the country," the group's Eyal Ben-Reuven told The Times of Israel. Ilan Gilon, of the left-wing Meretz party, said the allegations cast a "heavy shadow" over the prime minister. But members of Mr Netanyahu's right-wing Likud party have been quick to defend him. Tourism Minister Yariv Levin said the police statement was a "despicable move" designed to "carry out a government coup against the will of the voter". Despite the heated debate within Israel, international reaction has been more muted. A spokeswoman for the US State department emphasised Washington's strong relationship with Mr Netanyahu and insisted the issue was an internal matter. A final decision on whether Mr Netanyahu should face charges will come down to the attorney general's office. A decision could take months to reach. Justice Minister Ayelet Shaked said any prime minister who has been charged should not be obliged to resign. The next legislative elections are scheduled for November 2019. Mr Netanyahu heads a fragile coalition, but on television, he appeared confident the allegations would not spur new elections, reports BBC.